The House on Wednesday is expected to consider a bill that would strip health insurance companies of their antitrust exemption, House Majority Leader Steny Hoyer (D-Md.) said during his weekly briefing with reporters. This is an important step forward to make sure that “competition is vigorous” and prices are set by the market in the insurance industry, he said. In a separate news briefing, House Speaker Nancy Pelosi (D-Calif.) said she hoped the antitrust legislation “passes with significant bipartisan agreement.” The vote will ask lawmakers, “Are you on the side of the insurance industry or are you on the side of consumers?” she said. President Barack Obama offered additional support for the bill in a statement, claiming it would "give American families and businesses, big and small, more control over their own health care choices by promoting greater insurance competition. The repeal also will outlaw existing, anti-competitive health insurance practices like price fixing, bid rigging, and market allocation that drive up costs for all Americans." 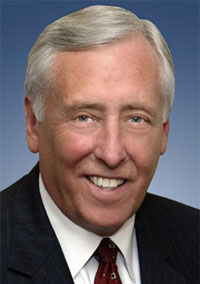 Hoyer nevertheless emphasized that he still wants to see Congress pass a larger-scale health reform bill in the future. “I hope we can do it all,” he said. Starting over on healthcare reform, an often-repeated request of the GOP, is not a realistic request and it won't get the job done in an efficient manner, Hoyer continued. “We'll see what happens on Thursday,” when lawmakers convene at President Barack Obama's healthcare summit. “We hope the Republicans will come forward with some realistic proposals, and, if so, we'll consider them,” he said. At the same time, he called the White House's newly released, wide-sweeping reform proposal “a positive step forward,” adding that it would bring down the deficit in its first ten years of enactment, “significantly more than the GOP-led bill,” which covers just 3 million people, Hoyer said.